Spotlight tells the true story of the Boston Globe’s Pulitzer Prize-winning investigation into allegations of child abuse in the Catholic Church. The year-long investigation by the newspaper’s Spotlight team of reporters would find a cover-up at the very highest levels of Boston’s establishment. For as the film states: it may take a village to raise a child but it also takes a village to abuse one. Spotlight is an important, extremely powerful and dramatically gripping film. It is beautifully directed by Tom McCarthy and features superb performances from an ensemble cast at the top of their game. I would urge you to see this film. I went into Spotlight with a fairly good idea of the film's background. I think we have all heard about the horrific level of child abuse that has taken place within the Catholic Church. Spotlight doesn’t seek to go over such recently discovered ground. This is a film about the power of investigative journalism and the importance of personal responsibility. The movie’s focus stays with the, often frustrating and tedious, work of the reporters. It's not glamorous, it's not thrilling. It is long hours spent in a library. It’s research and the creation of spreadsheets. It’s doorstepping victims in the pouring rain and asking painful, but necessary questions. As we follow these reporters, the sheer scale of what has happened starts to sink in like never before. McCarthy has talked about being immediately grabbed by the ‘hook’ of Spotlight's story. Here we have an outsider, Marty Baron (Liev Schreiber), joining The Boston Globe as editor and, on day one, informing his news team that he wants to go after the Catholic Church. I was struck by how remarkably brave this was. 53% of his readership was Catholic. So Baron was well aware that the paper had to get the story right. It couldn’t be another report that the Church could dismiss as the behaviour of a couple of ‘bad apples’. It took an outsider to start asking the questions that others had not wanted to ask. As a result, everybody in this film has to accept a degree of personal responsibility - even the head of the Spotlight team: Walter ‘Robby’ Robinson (Michael Keaton). 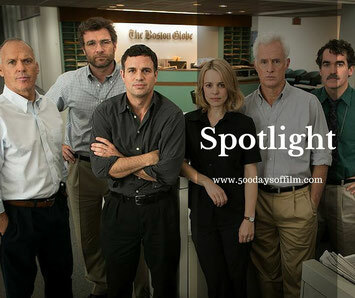 Spotlight features an impressive ensemble cast - and they are all superb. These actors have nowhere to hide. The camera is on them all the time and it is their timing, their delivery of the story's key information that gives the film its power and its drama. It is hard to single out one performance for individual praise. Michael Keaton is brilliant and holds everything together. Stanley Tucci is as fantastic as ever. Rachel McAdams is caring and sensitive in her role. As Sacha Pfeiffer, she has to ask the tough questions and gather the terrible details. Meanwhile, Liev Schreiber gives a wonderfully understated performance. However, beneath it all, you sense Baron's strength, his integrity. Mark Ruffalo disappears into his role of reporter, Mike Rezendes. His performance is all energy and edge. His anxiety becomes ours - his anger becomes ours. Ruffalo has the film’s main dramatic scene - the one in the trailer. Despite having seen this speech before, in the context of the film it is incredibly powerful and moving. I felt the toll that this story took on every one of the reporters. They are very much portrayed as human beings. I felt their fear for their own children’s safety, their horror that they could have easily been one of the victims, the sadness in their loss of faith. If ever there was a time to introduce an award for best ensemble cast, this is it. Some critics have dismissed McCarthy’s direction of Spotlight - calling it uncinematic. I would disagree. McCarthy’s direction is perfectly in tune with the story being told. To honour the work done by these reporters and to make a responsible film, McCarthy has matched Spotlight’s visual style to their reality. If you get the chance, I would really recommend watching Spotlight in the cinema. In a darkened screening room, you can’t look away - you are forced to look into the eyes of everyone involved. And then you begin to understand the scandal and the impact of the Boston Globe's investigation. 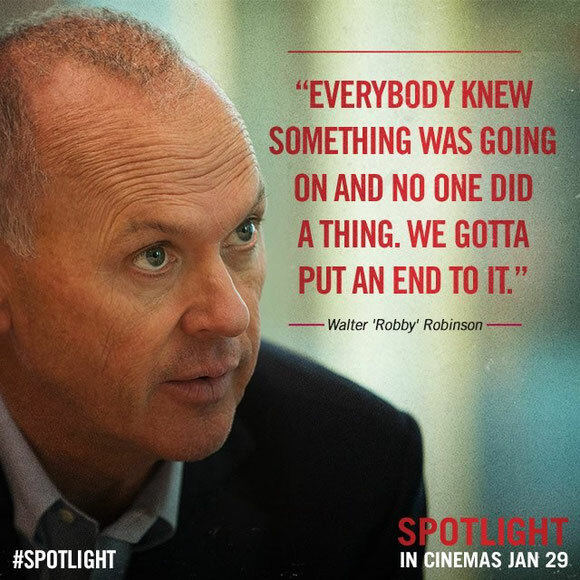 Spotlight has had a real impact in raising awareness about the issue of abuse within the Catholic Church. For example, just after the film's release, the Seattle Arch Dioceses published 77 names of priests who were pedophiles. I love Spotlight for its emphasis on the importance of strong investigative journalism. We need to hold individuals and organisations to account and we have to protect this work. It really feels under threat at the moment. It is also wonderful to see the journalistic process - from the first idea for a story, to the editing stage, from the printing process, to the wonderful sight of trucks leaving to deliver newspapers. In this age of screens, I still love print media. If you enjoyed Spotlight and are interested in a film on a similar topic, I would recommend Mea Maxima Culpa. This heartbreaking and, at the same time, empowering documentary looks at the abuse of young boys at a school for the deaf in Boston. If you have, what did you think of this film? Let me know by leaving a comment in the box below! Fab review Jane. Best film I've seen for a long time. One of those where I want to sit in my seat for twenty minutes afterwards to reflect on what I've just seen. Had a good old look on IMDb when I got home. Astonished by some of the poor reviews. Thank you 500 Days of Film Cinema Club - another fantastic choice. Can't wait for what's to come next. Another great film club experience and a great review! I'm pleased the film was focused on the investigative aspect of this story, I think anything else could have been too traumatic and alienated the audience. I found the closing facts about what happened post the publication of that first article both extremely sobering and disturbing. It was the ideal summation of the importance of this particular investigation. It silently and implicitly communicated a transference of power given to the hundreds of victims that had not yet had a voice. It also frankly frightened me to try and comprehend the extent of deceit within an organisation (and others I'm sure) at all levels, one in which many many people trust and believe in. What a terrible betrayal. All the ensemble cast gave totally believable performances, emotions were tangible and and Gave me a desire to google the real life investigation team. Would thoroughly recommend this film to anyone. Thank you Clare and Sarah for your comments. I totally agree Clare... I was stunned after the film ended and didn't think I would get to sleep afterwards. I had so much buzzing around in my head! Sarah you make an excellent point about the transference of power in this film. The level of abuse and the scale of the cover-up are both truly shocking. PS. Thank you also for your kind words about our fabulous film club! I love it too!